Good news: Life really does get better at 50 — in fact, according to one poll, the majority of Americans said that if they could stop time and live forever at one age, it would be 50. Which means that if you're in your sixth decade (or about to be), then you'll want to take advantage of this time — and stay as fit and healthy as the day you turned the big five-oh. Of course, we'd be lying if we said that hitting the half-century mark didn't come with certain physical downsides: This is around the time your start to naturally lose muscle mass, while weight accumulates your midsection. Fortunately, that doesn't mean you're destined to acquire a midlife muffin-top. Read on for all the food and fitness advice you need to counteract those pesky age-related changes happening in your body, and to stay you fit for years to come. 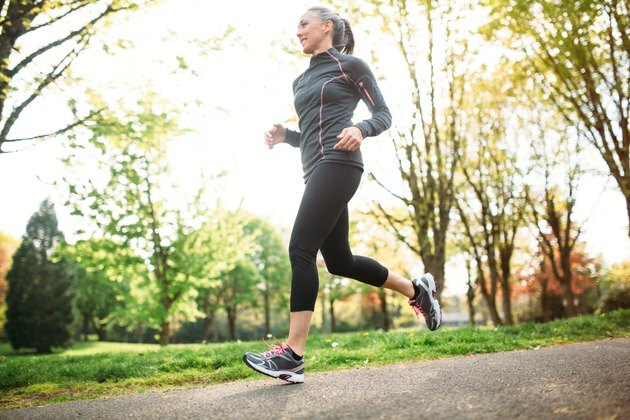 For women, unless you're considered very active (the equivalent to walking more than 3 miles a day at 3 to 4 miles per hour), you'll want to consume approximately 200 fewer calories in your 50s than you did in your 40s, according to the latest dietary guidelines from the USDA. The reason? That loss of muscle that comes with age results in a slower metabolism. If you're moderately active (equivalent to walking about 1.5 to 3 miles per day at 3 to 4 miles per hour), that means going from 2000 calories a day to 1800. And if you don't workout at all (which is about to change, of course), then you'll want to go from 1800 calories a day to 1600. If you're very active, you can hold steady at 2200 — at least until you hit 60, when you can drop to 2000. For men, the numbers are a little different (because, guys, you're slower to lose muscle mass compared women, so your metabolisms are still humming). Your calories counts stay the same until you hit 56, when — if you're very active — you'll want to go from 2800 to 2600 calories a day. Otherwise, you can aim for 2400 calories a day if you're moderately active, and 2200 if your lifestyle is basically sedentary. In addition to losing muscle mass with age, bones begins to shrink in size and density around age 50 for women, and closer to 70 for men. To keep bones strong, make sure you're getting 1200 mg of calcium a day, along with 600 IU of vitamin D (which helps with calcium absorption). The National Osteoporosis Foundation offers a list of healthy, calcium-rich foods, including collard greens (360 mg/8 oz. serving), fortified almond, soy or rice milk (300 mg/8 oz. serving), and sardines (325 mg/3 oz. serving). Added bonus: Those sardines are also an excellent source of vitamin D, containing close to half of the recommended daily amount. Read more: What are the health benefits of sardines? Vitamin B12 is the sort of thing you don't have to worry about until you're not getting enough of it. The vitamin is essential for keeping keep nerve and blood cells healthy, and symptoms that you're lacking in it include numbness or tingling in the hands, legs, or feet; muscle weakness and fatigue; and difficulty thinking. Unfortunately, according to The National Health and Nutrition Examination Survey, an estimated that 3.2 percent of adults over age 50 are seriously deficient in B12, and up to 20 percent may be borderline deficient. The reason the vitamin suddenly become an issue at 50: You have less hydrochloric acid in your stomach to absorb the B12 naturally occurring in food, reports the National Institutes of Health Office of Dietary Supplements. For that reason, it's recommended that you get most of your B12 from fortified foods (like cereals and non-dairy milks) or supplements. Be sure to talk to your healthcare provider about which route makes the most sense for you. Other supplement to consider: vitamin B6, omega 3, folic acid, calcium and vitamin D.
After 50, muscles tend to become less flexible. To reduce your risk of injury, you'll want to warm up before working out. walking or time on an elliptical machine to get blood flowing to the muscles to make them pliable. The American College of Sports Medicine recommends people over 50 strength-train all major muscle groups at least two and up to four times per week to gain muscle. Allow at least 48 hours between strength-training workouts for full recovery. Overtraining can cause injuries and setbacks in your plan, which can lead to muscle loss. If you're in your 50s, chances are retirement is still a ways off. Plus, it's likely that you still have kids at home who demand your attention. Which means that it's probably not easy to make time for the gym. If that's the case, consider sneaking in ten-minute workouts throughout your day, suggests the National Institute on Aging. Your minimum goal should be 150 minutes of physical activity a week. Are you in your 50s? Do you agree with these eating and exercise tips? Are there other questions you have for us? Leave a comment below and let us know.